Model T Ford Forum: Engine number? Model T Ford Forum: Forum 2011: Engine number? Is there some master list that shows when the engine were built by just looking at the number on the side? I've yet to fathom those numbers. I know they've got to mean date, cast lot and what have you, but just how to figure them, that's the question. I was told that it was a 1924 engine, but I'd just like to make sure. Anybody know when this engine was made? Go to the front page of this website and click encyclopedia. Then find the serial number list, which indicates yours is from Dec of 24. If you do the math you can figure out which day in December. If the engine was produced at the River Rouge plant then John's date of Nov 17, 1924 would be correct. If the engine was assembled at one of the other Branch Assembly Plants from parts supplied from main Detroit Plants -- then the serial number most likely would have been stamped later. Finally -- if the engine block was replaced by a Ford dealer (owner allowed the block to freeze, ran car low on oil and threw a rod etc.) 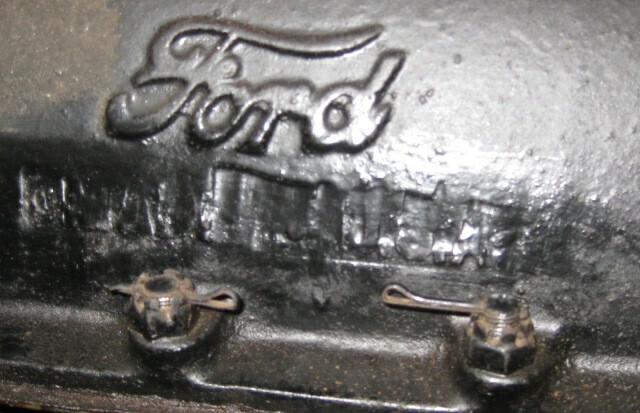 the Ford dealer would stamp the replacement bock with the original engine number from the damaged block. For USA engines after Dec 1921 normally would not have a casting date. Canadian engines continued to use casting dates much later (I would guess until the end of production -- but we have data points through 1925). Often times the replacement block would have an engine serial number stamped onto it, that was earlier than the casting date. If you do not have a copy of Bruce McCalley's "Model T Comprehensive Encyclopedia" you might want to ask Santa to bring you one. It helps make a lot of sense out of so many of the deferent items related to our T. Available from Bruce at: http://mtfca.com/encyclo/mccalley.htm as well as the Model T Vendors. Thanks again guys, I guess I'll just have to add another book to my list of things I want (although it's probably too late for Santa). I was surprised by your comment above: "If the engine was assembled at one of the other Branch Assembly Plants from parts supplied from main Detroit Plants -- then the serial number most likely would have been stamped later"
I always thought all Model T engines were assembled, tested and the engine number affixed at Highland Park and were shipped to Branch plants to be installed in Branch assembled vehicles? During the Model T era, great numbers of engines were assembled at the Ford branches. Apparently Ford printed engine number job sheets which were numbered in advance, and these were attached to engines being assemble. These job sheet numbers were stamped into the cylinder block when the job was completed. Groups of these engine number records (not engines) were also shipped out, and these numbers were then stamped on the engines when they were completed at some Ford branch. Some of these record number shipments were noted, but most were not. As a result, while the Highland Park (or, later, the Rouge Plant) assembled engines on the days indicated, other blocks of engines might have been assembled days or weeks later. Where blocks of numbers are noted �omitted,� these number records went to other assembly plants; quite often to Manchester, England. That is also an illustration of how casting dates could be after the engine serial number date. On Jan 7, 1918 Highland Park sent 200 engine numbers to Long Island, NY (2,461,201 to 2,461,400). But then on Jan 16, 1918 Long Island, NY returned those engine numbers and they were stamped onto engines assembled at Highland park on Jan 16, 1918. � Nine days after the other serial numbers in that same range had been stamped. From the entry on page 515 to page 523 there are numerous referenced to blocks of engine numbers being shipped to Long Island and also Manchester. Starting on page 523 Bruce stopped noting the �blocks of engine numbers� that were sent to the branches. But you can still tell which days there were blocks of serial numbers sent to a branch by comparing the serial number range to the production number listed. If they were the same then no serial numbers were sent to a branch. If they are different � that number of serial numbers were sent to one or more branches. Bruce�s book is out of print but can still be purchased. I recommend his CD version as it is more up to date and more affordable. But the hard copy is still nice � just double check the CD for any updated information. Hap, have you seen the book, "Faces of Ford - The Windsor Years"? It has a lot of great photos of the plant as it expanded in Canada. I don't think it provides enough documentation to corroborate everything above, but it does list some interesting facts (but without references). For example, on page 23 it has a list of dates for when Ford of Canada starting building various parts of the Model T, such as Differentials on 2/1/12, Magnetos on 5/8/13 and Motors on 5/20/13. Clearly this was not the whole motor, because it lists dates for other subcomponents that came later, such as the Engine Pans on 3/14/16 and Crank Cases on 2/14/17. It also says on page 42 that on 5/20/13 Ford Canada began to build its own motors from castings furnished by the Holmes Foundry of Port Huron Michigan. I know that Canadian Fords built after that date have the "Made in USA" ground out so perhaps they supplied them with "Made in USA" also? (that doesn't make any sense to me though). As an interesting aside, it shows the very steep ramp from the third story of the factory to the ground that was used to bring down the completed cars. Apparently there were a number of near misses to going in the river at the bottom. Anyway, it says that the ramp was used until 1915 when the new machine shop with 1,300 machines was added. On page 32, it has info from a Ford Times Article from April, 1916 that describes the new machine shop and specifically describes milling machines for the cylinder blocks. Hap , Two thoughts after reading you post : The engine numbers that were shipped off to the branches COULD explain the odd engines with the looong lag time between casting dates and serial number date-of-assembly . Of course , so could reject engines , and there WERE reject engines , repaired , and re-numbered , but what current T owner wants to hear that their pride and joy was a " FACTORY REFURBISHED " engined car ?? Second , I doubt that Ford ground off the " USA " on blocks and heads . It`s far more likely that the " USA " was scraped off in the foundry , from the sand molds BEFORE the iron was poured into them . It`s hard to imagine that Ford would grind HARD iron , but not scrape SOFT sand !! I agree with you Doug, I have 3x 1916 C engines and can see no sign of grinding, just a nice uniform of sand casting. Milling 12 castings, or 48 cylinders at once. The heat treating is the same photo. John , Thanks for your picture !! That block`s " Made In The U.S.A. " certainly and clearly has been ground , or possibly chipped off . I cannot imagine that that would be a practice any competent industrial operation would continue for any length of time , for the reasons that I stated above . This practice , I GUESS , would logically have been carried out for a very short time span . Does anyone have a time frame for the period this operation was carried out ?? Kerry`s 1916 blocks clearly mark one end of this grinding practice , how much earlier did it stop ?? I try to learn more each day , and as I do , I realize how little I really knew !! Have a VERRRY MERRY CHRISTMAS , ALL !!! !